1 . 2 . 3 . 4 . 5 . 6 . Now off to find some short short swim trunks for Finn that will show off his glorious thighs! Cute swim suits! I saw mini Boden had the short short trunks... Not sure if it's for Liam's size or Finn's, but worth a look. Love all of the trunks. They are so fun. Who could resist those adorable little thighs? Can't wait to see what you find. Cute suits! We always have two sets of suits, one for Grandma's, one for our swim bag! Mentioning Flathead Lake has me daydreaming of being back in Montana, sigh! So many cute pieces! We can't wait for our first trip to the splash pad!! I love these swimsuits! This reminds me we need to get one for Sophie, she doesn't fit in any of hers currently, too small, she grew a few inches. My favorite are the sharks! Too cute! I ordered some of those shoes for Liam. Just waiting for them to arrive! Swim season is my favorite (for the kids - not me)! Marcus has entirely too many suits and rash guards, but he needs those Gap sunnies and Natives! Love these! Does Liam wear flip flops? I was going to get Mac a pair this summer, but I think he'd have an issue with having the strap between his toes. I just don't know. He's a camo Crocs wearing kid most of the time. He has a pair of Natives, but doesn't love them like the Crocs. 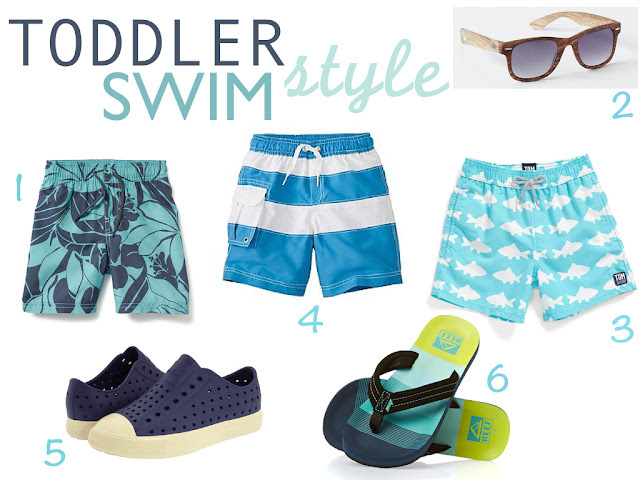 Mason is taking swim lessons in June and we are on the hunt for swim trunks and flops! I love those turquoise ones with the sharks. Thanks for posting this. I am off to shop! Finn does have glorious thighs haha. why are little kids swimsuits so freaking cute?! i can't handle it. Cute! I can't wait to get Logan in the water. And I also can't wait to see Finn's chubby baby thighs in trunks. haha! We've been avoiding the pools due to the fact that Mason got tubes last August but I think we will be good to go this summer! I wish we weren't in a drought because I LOVE the idea of splash pads. We went to one once and Mason LOVED it but they are so hard to find since we're in so much of a drought. I understand it but it's such a bummer! I cannot WAIT for swim weather!! This is the second time today I've seen those shoes...I think Cam needs them!! Love the trunks and the sunglasses!! !